Sarah Champion MP has urged local businesses, schools and the community to sign up to receive Child Rescue Alerts, a new national system designed to alert the public, as quickly as possible, to abduction or other urgent high risk child disappearances. Child Rescue Alerts can be used anywhere in the UK and at a local and regional level and are sent directly by text, email and via app notifications to alert people quickly about a child's disappearance. The initiative is a partnership between the National Crime Agency, UK charity Missing People and Technology company Groupcall. Statistics show that the initial hours after a child is abducted are crucial, and a sighting by a member of the public can lead to the safe recovery of the child. The scheme is supported by Kate McCann and Coral Jones, mothers of Madeleine McCann and April Jones, who have been in Westminster urging people to sign up. It is free to register and to receive alerts. 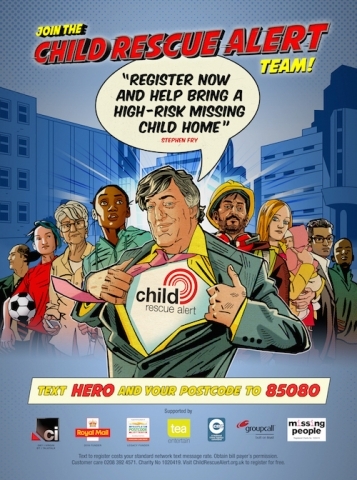 Go to: www.childrescuealert.org.uk or text HERO and your postcode to 85080. I'd encourage everyone to sign up to receive Child Rescue Alerts to help find vulnerable children in those vital first hours after they go missing. In Rotherham, there are over 18,000 children, If one were to go missing, it is vital that as many eyes and ears as possible are on the ground to increase the chances of the child returning safe and well. "It's quick, it's free and could help save a child's life. You can read the release in full here here and sign up to Child Rescue Alerts here.